Since 2007, the BSA has made available an annual fund of £20,000 for research projects involving BSA members. There are two opportunities per year to apply for grants of up to £5000 for projects to be completed within two years. The grants are for small-scale applied research in areas that are clinically relevant (now or in the future) to hearing, tinnitus and/or balance. The funding may be used for most aspects of applied research other than dissemination of results by paper or at a conference, or the attendance at training meetings. Indirect research costs are entirely excluded. Funding to top-up an otherwise part-, self-, or un-funded PhD will be considered. The limit is £5000. To encourage collaborative research, this year a key change has been made: an application requires two principal investigators, one an academic, the other a clinician in a relevant discipline. Both must be members of the BSA at the time of application. 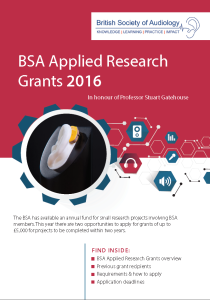 It is a requirement of funding that the work is presented at a BSA meeting or conference. The conference registration fee for one of the research team will be funded by BSA in addition to the Grant, and therefore does not need to be included in the costs. Please ensure all required documents aswell as your completed application form are submitted as one combined document, thank you.